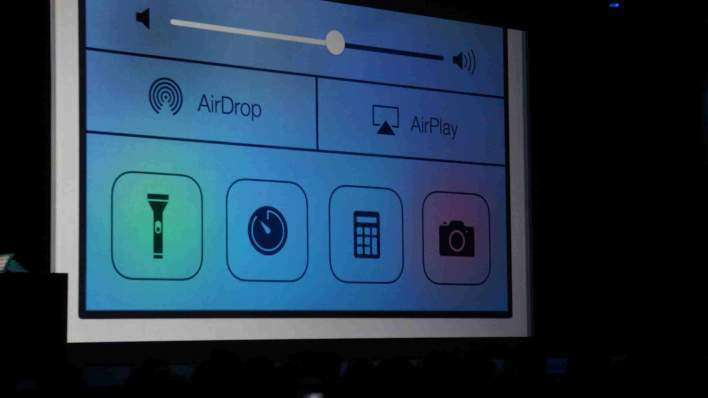 As part of a major redesign of iOS 7, Apple(s AAPL) showed off some very drastic facelifts for core iPhone apps. A lot of those changes will also seem very familiar: from the new Mail app to Calendar to Weather, it’s pretty clear that Apple has learned well from its army of third-party app makers — and from its biggest competitors. The basic productivity apps that Apple offers by default have a much more uniform look now: they use a lot of white space with very skinny black font. The overall effect is a far more clean and simplified; gone are the shadows and textures and multicolors. The control buttons have been updated as well in this same theme. Apple updates these apps a little bit here and there with each new version of the iOS. But we’ve never seen as dramatic an overhaul of them as we saw today. The new Calendar, for example, doesn’t just look a lot cleaner, it does more stuff too. And I was immediately struck by how Apple had incorporated some of the nicest features from my favorite iOS Calendar app, Sunrise. iOS Calendar now automatically incorporates Facebook Events right onto your calendar, and it also shows you the weather forecast for the day; both are really handy features Sunrise introduced with its iOS app earlier this year. But that’s not all. Calendar now also features a neat feature seen previously in Donna and in Google Now: once an event is created and the location is inserted, Calendar will estimate how long it will take you to travel — by foot or car — to your next appointment. That travel time is then blocked out on your calendar so you don’t have any overlap. Like those two apps (and plenty others) Calendar will also auto-suggest locations when you’re inputting events. 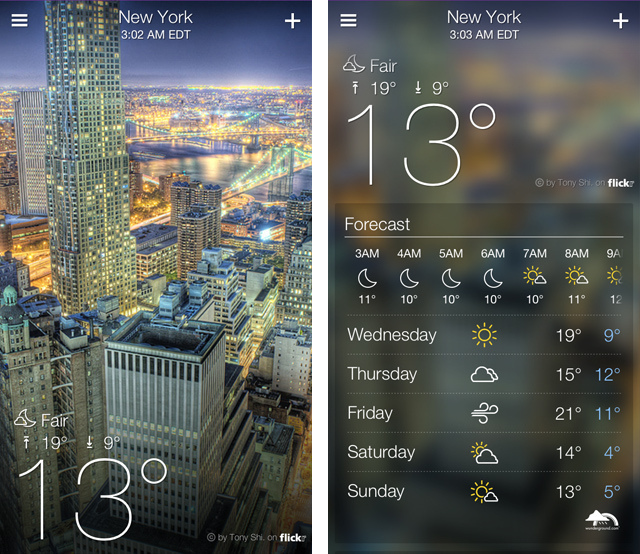 Another basic app where Apple had been very badly lapped by the competition? Weather. 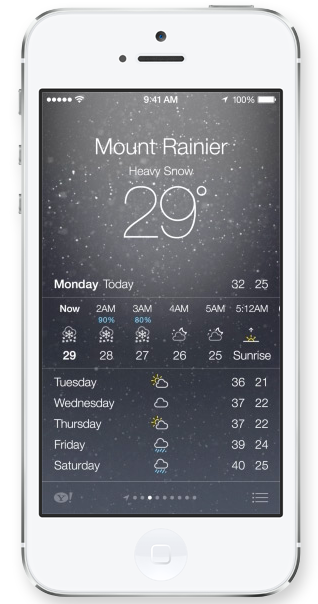 Apple had long neglected this one and it got to the point where even Yahoo was making a snappier and more elegant iOS weather app than Apple. And, oddly enough, Apple’s new app looks almost identical to what Yahoo brought to the App Store very recently, from the translucent background to the incredibly skinny font, to the layout of each element. The new Weather also has better animations, and supplies far more important detail than previously. The new Camera app also caught up with every other photo app out there and added filters. It’s not likely this will dissuade many Instagram users from opening that app when they’re looking to turn their photos sepia or black and white. But it at least shows that Apple is watching what the trends are and understands the kind of (very) basic features it needs for its core iOS apps. And it’s clearly not afraid to borrow. The outside inspiration didn’t really stop with filters either: Apple also finally has Flashlight as a default app, available in the new and very handy Control Center menu. That should come as not-so-great news to the nearly two dozen Flashlight apps currently on offer in the App Store. Apple’s Mail also looks a lot cleaner and crisper; it actually looks like it belongs with the Mailboxes and GMail apps that many iOS users are already using. It’s good and necessary that Apple has dramatically updated its core iOS apps: they’re the apps that many users will first experience iOS through. But taking a few key features from its competitors and third-party appmakers here and there isn’t enough. If it truly wants to retake the core of the iPhone — and fend off Google, Facebook and Amazon — that means Apple’s productivity apps and understanding of the web have to be better than what Google is offering; its social and communication tools to be better than what Facebook is making, and its entertainment content, from movies to music to books, needs to surpass that of what Amazon can cook up. And that’s likely to involve an upgrade to the core experience that rivals nail, but where Apple struggles: cloud services. 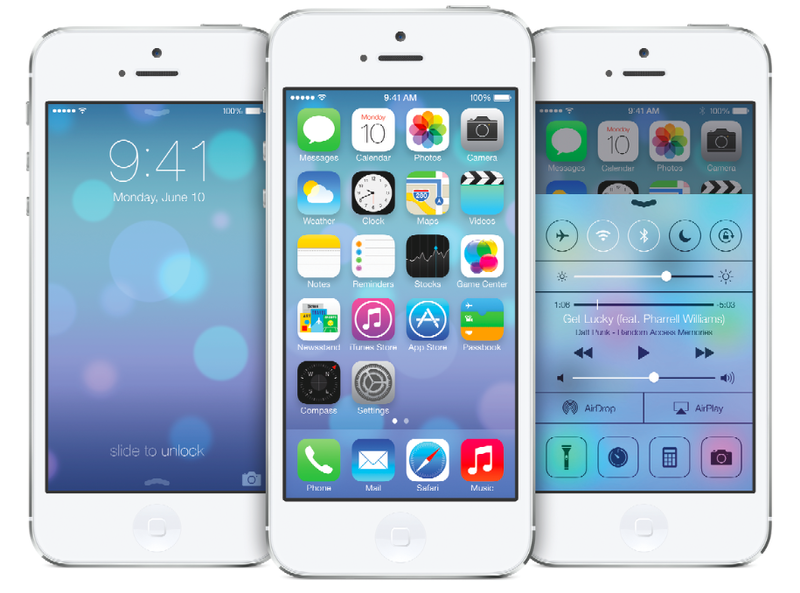 iOS 7 will bring some welcome upgrades to those apps, and if Apple ever gets its cloud act together, it could entice more iOS users to remain fully within the Apple experience. “…nearly two dozen flashlight apps currently on offer in the App Store…” ?! Try nearly two THOUSAND flashlight apps. Happy with new functioanlities, but lost its uniqueness in look and feel. RIP Design team! Well, it seems only fair since Android copied iOS all those years back when it realized that copying the Windows CE/Blackberry experience wasn’t going to cut it. I’m just joking to make a point, of course. Seriously, though, can we quit this whole flame war crap? You like Android and don’t like iOS. Cool. Use that instead. I like iOS better than I like Android. I’ll go ahead and use mine. The constant need for users on either side to “prove” why their platform of choice is superior is petty and childish. Looking forward to the iOS 7 upgrade, especially with all the hype it has been creating.. The Mail app looks extremely similar to the Mailbox app by the creators of Wunderlist.